Written by Ray D. on November 27th, 2018. Shwip is a twin-stick shooter being developed by Jamhammer Games. It is currently in Steam Early Access, with release date TBA. 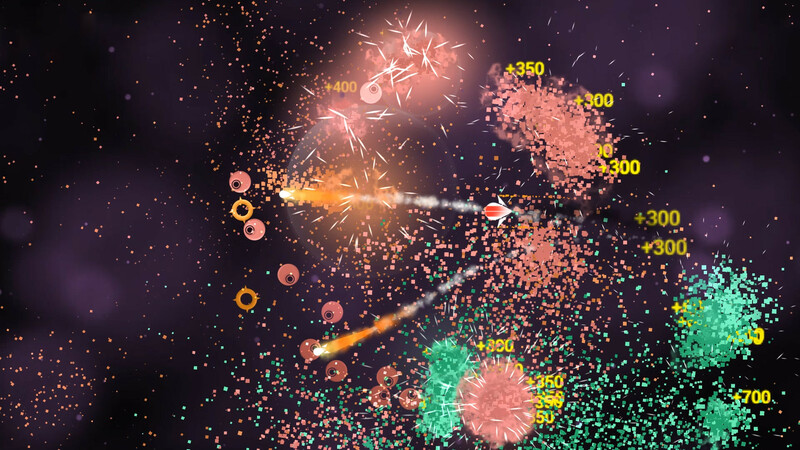 Shwip plays like a homage to Geometry Wars, in that you pilot a fast-moving, fast-shooting spaceship in a bound box, taking out enemies of different shapes and styles. It is heavily neon and has an almost zen aesthetic. Gameplay in Shwip is fast and frantic, with you piloting your ship at high speeds across the play area (and outside of it, on occasion) as you take down hordes of enemies. Each enemy unit has its own logic. Some enemies move quickly, and others slowly stagger towards you. 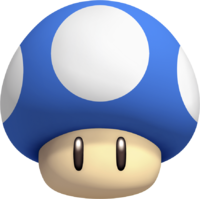 Circular, sawblade-like enemies will rush you relentlessly, while others will only chase you while you are facing away from them, kinda like a certain ghost character from the Mushroom Kingdom. There is one enemy type that moves based on player input — you move left, they move left, etc. At your disposal in Shwip are a handful of different tools for destruction. Your primary fire is a simple two barrel blaster, you have a secondary fire that launches missiles for some splash damage, and you have two gadgets — a magnet that pulls enemies in and a remote mine that explodes on contact. I’ve found that using the two in combination is pretty satisfying. 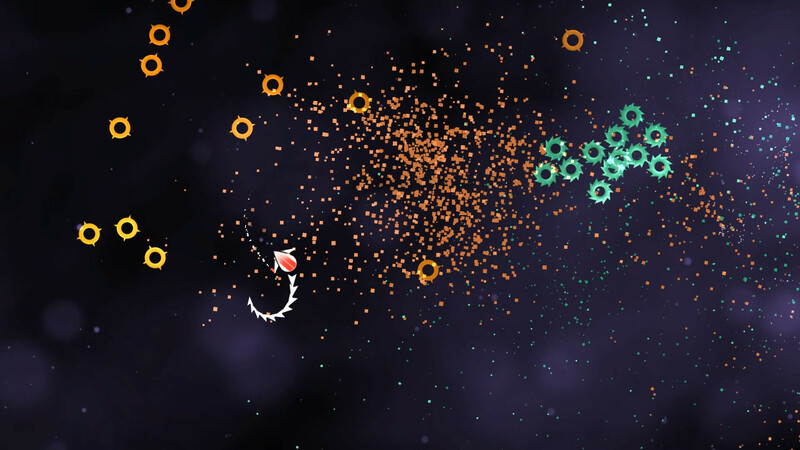 You’ve also got two abilities: a dash which launches your ship forward at high speed and can even let you temporarily escape the bounding box of the game arena, and an outward push that gives you some space when enemies are closing in. The most notable tool at your disposal, however, is probably your whip — a unique mechanic and the tool that gave Shwip its name. Your whip acts as a melee weapon of sorts. Pull it out and keep it moving, and it will destroy everything on contact. It is a very unwieldy tool (more on that later), but powerful when it’s effective. 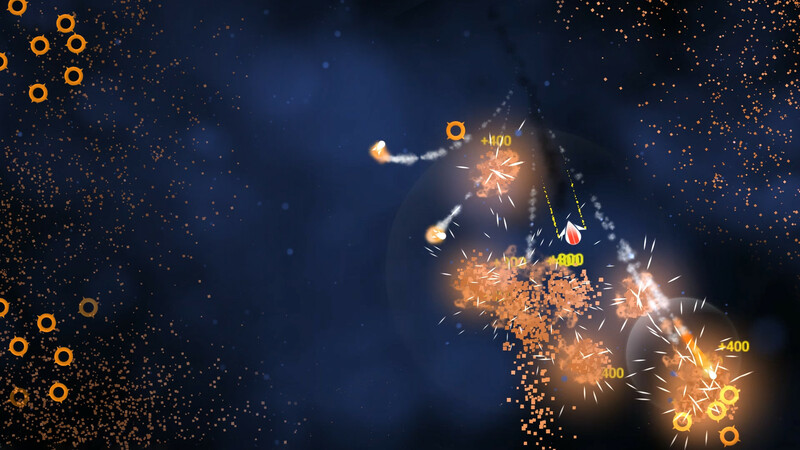 The main gameplay mode of Shwip is a three-minute infinite wave mode, where enemies keep coming after you. Your goal is to destroy as many as you can while dying as little as possible. Death is not a game over situation. Instead, dying halves your current score multiplier, reducing the points you earn for each kill and forcing you to build it back up. I found this death mechanic to be really enjoyable, only taking you out of the action for a moment while simultaneously rewarding you for staying alive and giving you a chance to recover from an untimely demise. There are currently three released game modes: Arcade, Practice, and Minefield, as well a slot for a fourth called Style mode. Shwip’s Steam page describes Style mode as “[the place] where you show off your newly formed skills. Link up attacks using different weapons, fly dangerously close to your foes, [and] minimize your time spent out-of-bounds to increase your style multiplier. Then spend your hard-earned points on upgrades to your Shwip’s awesome arsenal.” Whereas Arcade is made for quick three-minute bursts, Style may be suited for longer play sessions, noting “[the] difficulty slowly increases, and enemies get harder to kill”. Style mode is definitely something to look forward to in the future. While most of my time with Shwip was exciting and entertaining (I am a twin-stick fanatic and they are one of my favorite genres to review and preview), not all of it was. There were some points of contention. Now is a good time to talk about the other main game mode currently available: Minefield. 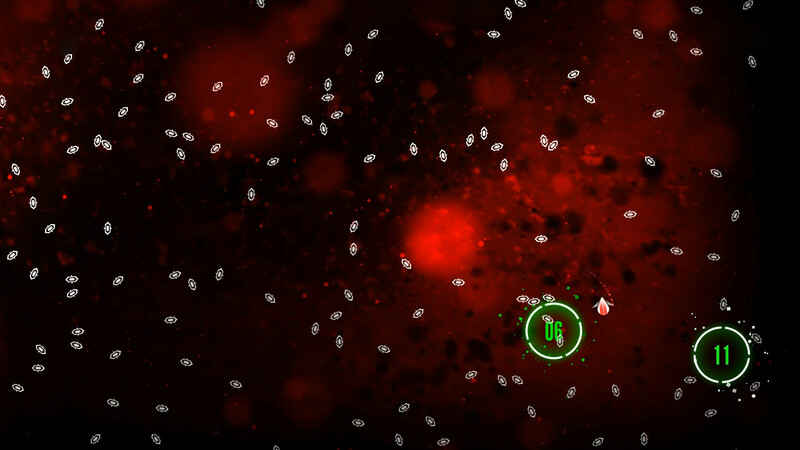 Minefield tasks the player with piloting the ship to randomly spawning circles while avoiding a litany of proximity mines scattered about. This has the makings of an interesting game mode, but that is not what it is. Minefield is a frustrating and exhausting experience that needs a second look. Minefield is not as fun as it could be. The game’s controls are simply not tight enough to navigate through a minefield so densely packed. Collision with a mine means ship death, which puts you out for several seconds (in a game mode that only has a several second timer), meaning you spend equal amounts of time navigating as waiting to respawn. Frustration is not a satisfying mechanic. The game mode does not escalate in a satisfying way: the amount of mines on the map starts high and stays high, as opposed to growing over time, and surviving longer periods of time does not give a sense of growing suspense. It should be nerve-wracking and exciting the further you go. Shwip is a fairly polished product as of this writing, but it does have some serious bugs I hope to see fixed. Aside from the controls being a little too loose, they almost completely demand the use of a controller. A mouse and keyboard is an optional control scheme, but it handles so poorly I would rather a controller be necessary at this point in time. Aiming is done on a mouse by rotating the blasters around the ship in a way that emulates using an analog stick. It emulates very poorly, however, and the mouse is not consistent in any way, nor is there any kind of targeting reticle to help give you bearings. My recommendation is to use a controller for the time being, though the controls will still not be without fault. There is a keybind to allow you to toggle between whip, rockets, and cannon, but it does not work. Controlling the whip is a bit frustrating and the source of a major bug. You move the whip by moving your analog stick, its direction dictating the direction of the whip. The whip never moves fast enough to gain any kind of momentum unless you just constantly spin your thumb in a circle (which is a legitimate tactic, I suppose), and without momentum, the whip will not destroy anything. It behaves less like a whip and more like a limp tentacle, unless you use the MeatSpin tactic. The major bug comes into play when it touches an outer wall of the game area. Doing so destroys segments of the whip and renders it fairly useless unless you unequip it and equip it again. Now, this could be a feature, but it is never described as such, and it doesn’t make for a very good one. With Shwip being an Early Access Unity game, it’s much more likely that there is an OnCollision discrepancy between the whip and the wall. Any feature that can be mistaken for a bug is, in fact, a bug. One other frustrating bug I feel the need to mention is the camera — the closer you are to the center of the game area, the farther in the camera zooms. This causes it to behave a little funny when you dash across the map, and it can be frustrating when you pass through the center with enemies on all sides. Again, this may be a feature, but it is certainly not a good one. My time with Shwip was a good time, bugs aside. I am a lover of all twin-stick shooters and Geometry Wars was perhaps my GOAT. 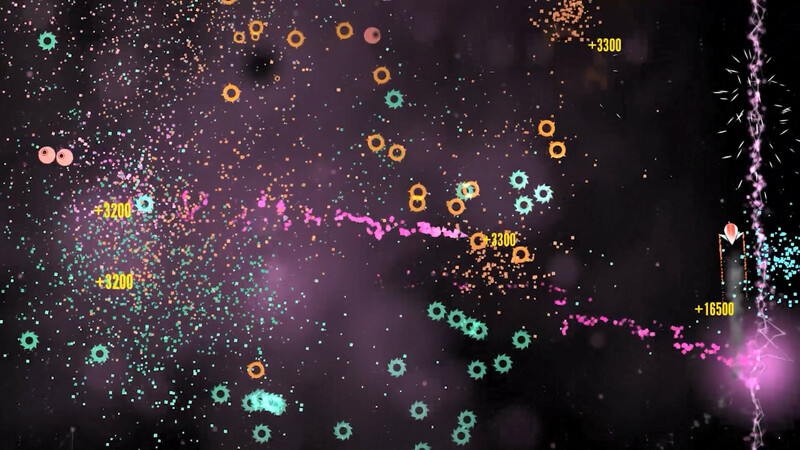 Shwip evokes the same feelings in me that Geometry Wars has before. It is fun, fast-paced, and challenging. I’m eager to see the release of Style mode and what kind of challenges it will offer. Jamhammer Games has something special here, and I hope they keep up the good work. There are things that need to be fixed or changed before I would recommend a purchase of this game, but I hope to see them come full release. While a release date is not specified, the game went into Early Access on November 15, 2018, and at the time the developers said, “A generous amount of time in early access for us would be less than two months.” As I said before, the game is already quite polished, so I think we can have faith in their claim that a release is coming soon. If you just can’t wait to give it a try, Shwip is available for Early Access purchase for $9.99 through Steam.